The following is an excerpt from my upcoming first honest-to-goodness book, titled (for now) 'The Official Manny's Chile Bowl Cookbook'. Dunno when it will be published, but I'm shooting for sometime next year if I can maintain discipline and keep writing cooking writing cooking writing. Also, the Manny I refer to (my Dad) has yet to actually, you know, READ this stuff, so I expect him to have a few specific issues when he gets the first draft. Oh boy. Make no mistake about it: Mexican food is what it is because of beans and rice, those two staples of starchy wonderfulness, those foundational pillars of every Mexican food lover’s cravings. The smell of them cooking can send me into a time-warp, right back into my Grandma Silva’s kitchen, back to when I was just a kid and helped her clean and rinse the whole beans, then watch them slowly bubble away on the stove for hours, turning brown and beautiful. I’ve told this to many people who scoff, but if you drive on the I-5 Santa Ana/Golden State Freeway though East Los Angeles on a Sunday morning, the overwhelming aroma of refried beans whacks you in the head, makes you sit up and salivate, makes you want to careen off the freeway and find the first tortilleria that is open and beg them for a plate of fresh beans and tortillas to scarf down in an instant. I know that sounds extreme, and maybe it is… maybe. When Grandma Silva was gone from our lives, we’d get a fresh pot of whole beans from my Aunt Peggy every week, along with a huge stack of hand-made flour tortillas… que bueno! When Dad made fresh beans himself, he would cook the beans exactly the way those two amazing women did, and the aroma would make me think of Grandma Silva and Aunt Peggy all over again. Naturally, we would eat the fresh beans for dinner that night, but the next night Dad would ladle a mass of them into a frying pan, mash them up, add some oil and cook them again. 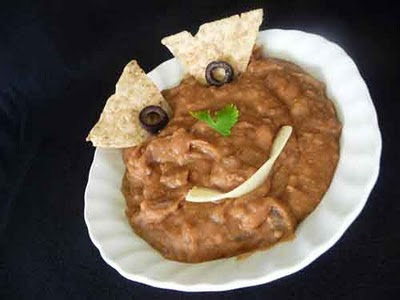 ARRIBA… refried beans!!! What didn’t get eaten would stay in the pan to be covered and stashed in the fridge until the next night. He’d add some more beans and mash and cook them again… RE-refried beans! By the end of the week, the older refrieds and the newer refrieds were all mixed together deliciously, and (I know this sounds gross) a fantastic crust of refried beans would form around the inner edges of the pan, only to be scraped off and mixed in with the mass and cooked again. This… this is the stuff that makes me crazy for Mexican food, that allows me the ability to measure the quality of refried beans that are served up in restaurants against the best ones I ever ate, the ones I ate as a kid at home. I figure, if a restaurant can do really good frijoles refritos (refried beans), then the rest of their menu must be great as well. As I’ve covered elsewhere in ‘The Beans and Rice Story’, there are two ways to make refried beans: old skool from scratch (crazy labor and time-intensive) or, as I do these days at home, using the modern savior of Mexican cooking, CANNED REFRIED BEANS. Yes, I know… how could CANNED REFRIED BEANS be in any way as tasty and/or delicious as scratch-made beans? Well, unless you are possessed of the world’s most delicate palate, I dinna think you’ll honestly be able to tell the diff, especially with a few tricks to turn the canned beans into really great ones. Besides, one of the reasons I'm writing this cook book is to de-mystify the art of cooking honest Mexican food and make it something that you’ll look forward to with anticipation rather than dread, if at all. So, here’s the simple, fast-and-tasty method to whip up La Puente-style refried beans. Place a small saucepan on the stovetop, burner set to medium. Open a can of refried beans of your choice (mine is Rosarita Traditional, avoid those other poseurs) and pop them into the sauce pan. Add a big handful of freshly-shredded Longhorn-style cheddar cheese (Aunt Peggy’s fave) and a couple tablespoons of vegetable oil. Stir to incorporate and bring the congealed mass to a slow bubble, then lower the heat and simmer for about 10 minutes, stirring and scraping the bottom and sides every few minutes. The aroma will be heavenly, and I guarantee you will stir the mass and lick the spoon every time, tho I NEVER do this when cooking for guests… HONEST! That’s it! You will have a gorgeous pot o’ refried beans to use for making tostadas, burritos, nachos and as a side dish for a faboo breakfast of fried eggs, bacon, beans and tortillas, simply the best brekkie there is. If you make a big batch of beans, save the leftovers for another meal, and be sure to scrape that crusty loveliness from around the edge the pot and mix it into the rest, then be prepared to enjoy real Mexican soul food. Cooking like this allows me to follow my bliss, honor the memories of Aunt Peggy, Grandma Silva, and especially the efforts of my Dad to feed us right when we were kids and offer some of the finest ‘home-cooked’ Mexican food in Northern California to his customers for over two decades. Refried beans have always been a staple in my house. Whenever we go to Costco/Sam's club we get a big case of the canned ones. We also make our own homemade beans, but we seldom make enough for leftovers. Would like to get the recipe of how my family made real beans! Usually we cook them in the crock pot, with bacon and onions but that's it. let them cook for almost a full 24 hours. Can't wait for the book to come out though! !